Dwelling beyond the ordinary, Eagleburg Enclave (spread over 230 acres) developed by M/s. Eagleburg India Pvt. Ltd., located abutting their proposed tourism approved Eagleburg Golf Resort (spread over 180 acres) with an 18hole International Standard Golf Course. Eagleburg Golf Village, just 5.4kms from the ring road and approximately 12kms from the Mysuru Palace on Mysuru-Malavalli Road is an upscale plotted development with highest standards never seen before in Royal city of Mysuru. With picturesque views of the golf course, man-made water bodies & host of amenities to choose from, Eagleburg Enclave presents an opportunity to opt for an unmatched lifestyle for the deserving few in close proximity to Mysuru. Eagleburg Enclave has been approved by MUDA & DTCP respectively. Plots in Eagleburg Enclave include 2400sqft, 3000sqft, 4000sqft, 6000sqft, 7500sqft & 10,000sqft and ready for Registration & Possession. It is currently offered at a price of Rs. 2000 per SqFt. Address: malavalli, Malavalli, Mysore, Karnataka, India. This Builder Profile page for "Eagleburg India Pvt Ltd" has been created by PropertyWala.com. 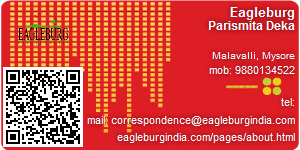 "Eagleburg India Pvt Ltd" is not endorsed by or affiliated with PropertyWala.com. For questions regarding Builder Profiles on PropertyWala.com please contact us.